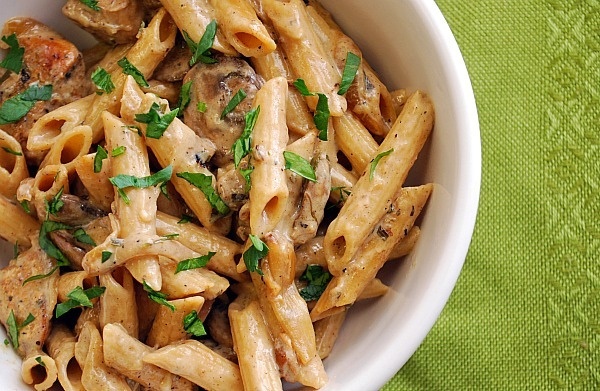 Melt additional 1 tablespoon of butter in skillet, add garlic, mushrooms and onion and cook for about 6 minutes. 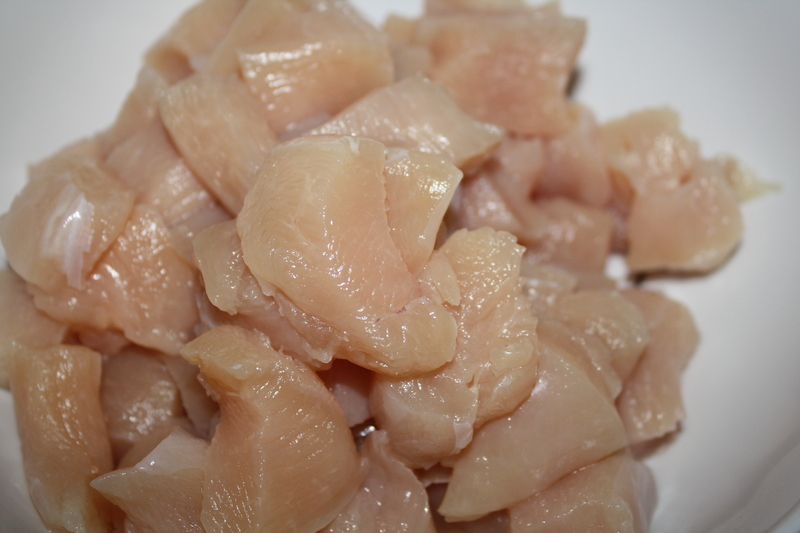 Add cooked chicken back into the skillet. 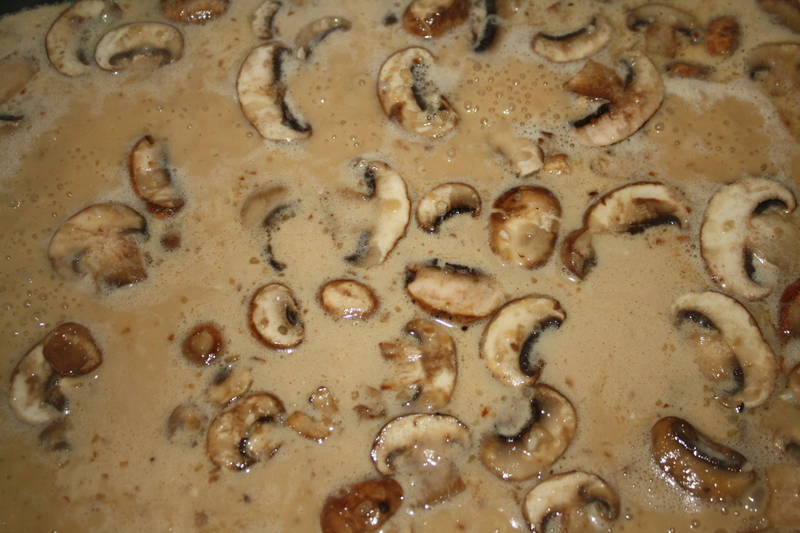 Add the Marsala, chicken broth and cream and bring to a boil. Simmer until sauce is slightly thickened. 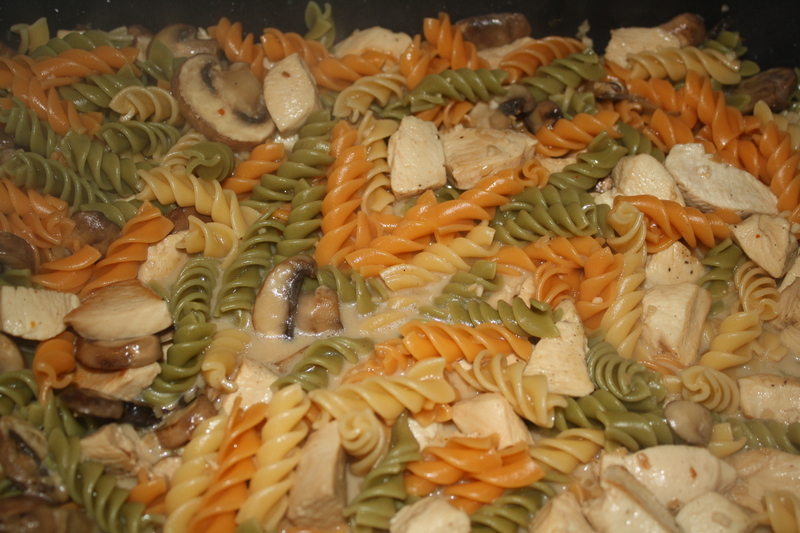 Drain pasta and reserve 1/2 cup cooking water. Return the pasta to the pot with the remaining 3 tablespoons of butter. 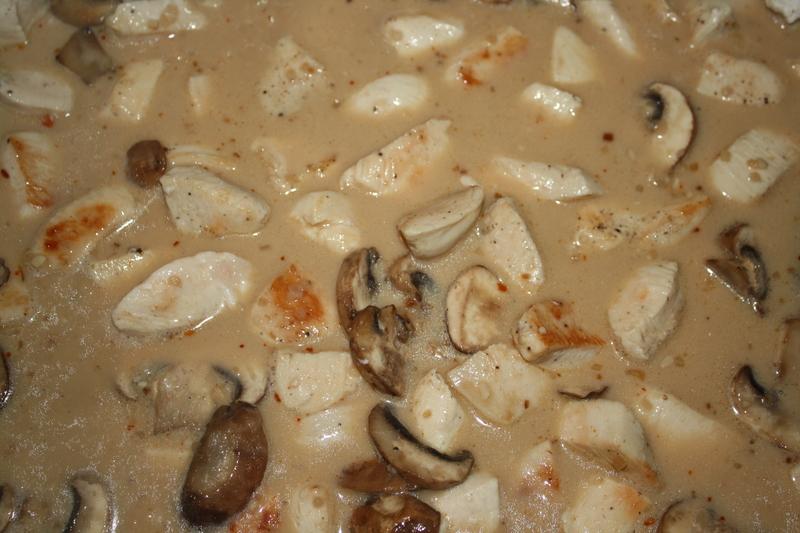 Add the mushrooms and chicken mixture and 1/2 cup of Parmesan cheese and cook until the pasta has absorbed some of the sauce, about 1 minute, adding the reserved cooking water as needed. Season with salt and pepper and serve with additional Parmesan cheese and a garnish of chopped parsley. Overall, the recipe was very easy to make. 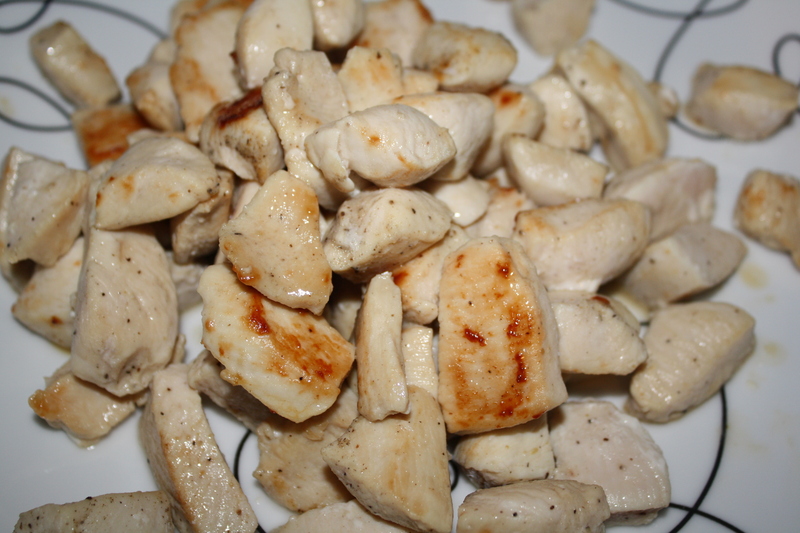 First I cubed the chicken and seasoned it with sea salt and black pepper. After the butter had begun to bubble in the pan, the chicken went in and cooked for about 6-8 minutes, until it was slightly browned. 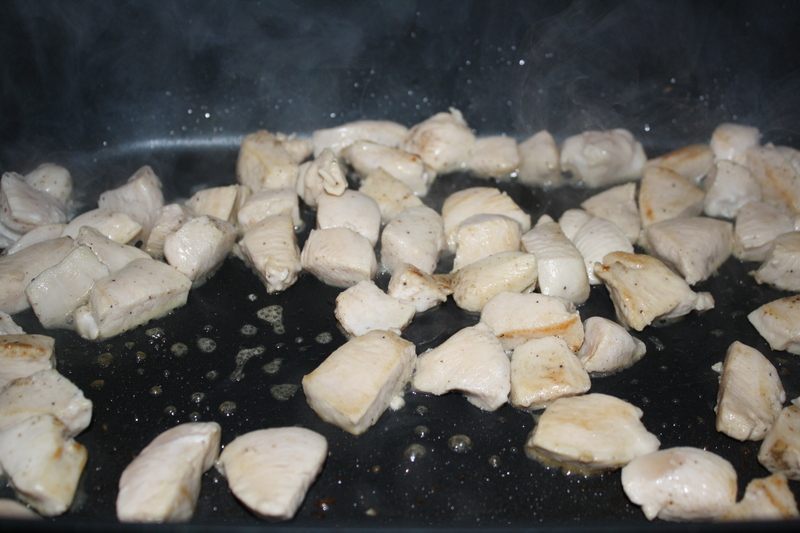 Then the chicken was removed from the skillet with a slotted spoon and put aside. Next, another tablespoon of butter was melted in the skillet, and the garlic, mushrooms and onion were cooked in that for a few minutes. The problem was that they really soaked up the moisture of the butter, so I had to add the chicken broth before six minutes were up to prevent the garlic from burning. 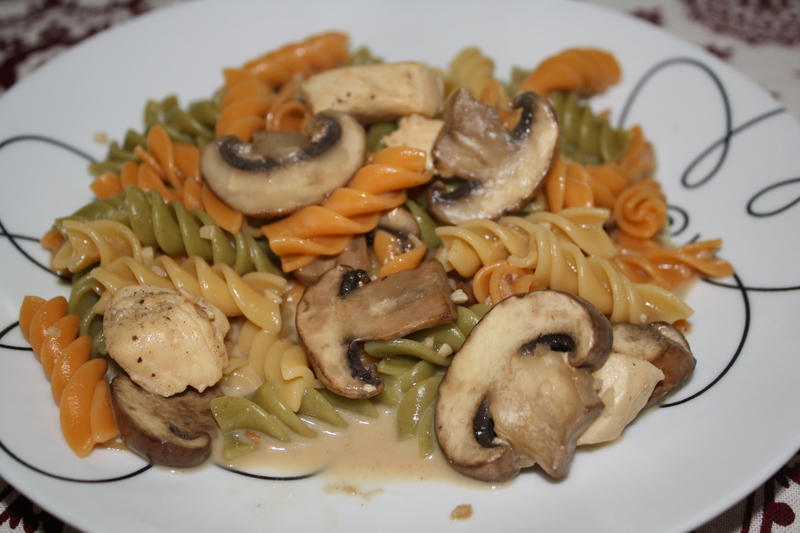 After that cooked for a few minutes, I added the Marsala wine and cream. I also added a few shakes of red pepper flakes here to give the dish a little zing. These continued to cook for several minutes while the pasta was cooking in a separate pot on the stove. Once the sauce began to thicken, the chicken went back into the skillet. And when the pasta had cooked, it was drained and added to the skillet along with the Parmesan cheese. After stirring and cooking for about a minute, the dish was ready to be served. Overall, it was very good, but I think that having to shorten the time before the chicken broth went in made it hard for the flavors to really blend, as if the garlic didn’t really get a chance to infuse beforehand. Manfrengesen thought the dissonance may have come from using rotini instead of angel hair pasta, which he thinks would have absorbed the flavor of the sauce a bit better. Also, I forgot to add the parsley, but that would affect the presentation of the dish more than its taste. But, as I said, it was very good. We had some leftover, and so reheated it for dinner the next night. By then, the flavors had come together much more completely, and that made it truly delicious.